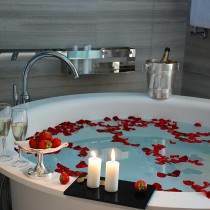 Relax yourself in one of our Romantic Executive room. Revive your body and your mind with a warm bath using scented bath salts or reinvigorate yourself with your private turkish bath. Tea and herbal infusions are at your disposal in the room.